The RP Photonics Buyer's Guide contains 21 suppliers for diode bars. Diode bars are high-power semiconductor lasers (laser diodes), containing a one-dimensional array of broad-area emitters, or alternatively of subarrays containing 10–20 narrow stripes. They typically contain between 20 and 50 emitters, each being e.g. 100 μm wide. A typical commercial device has a laser resonator length of the order of 1 mm, is 10 mm wide and generates tens of watts of output power or even up to ≈200 W; some prototypes even reach several hundreds of watts (possibly with a reduced lifetime). Within the last 20 years, the price per watt has come down by nearly two orders of magnitude, while at the same time the brightness (for a given power level) has been very significantly improved. Figure 1: Schematic view of the semiconductor chip of a diode laser bar with a fill factor of 50%. Most diode bars operate in the wavelength region from 780 to 860 nm or between 940 and 980 nm, with the wavelengths of 808 nm (for pumping neodymium lasers) and 940 nm (for pumping Yb:YAG) being most prominent. Another important wavelength is 975–980 nm for pumping erbium-doped or ytterbium-doped high-power fiber lasers and amplifiers. 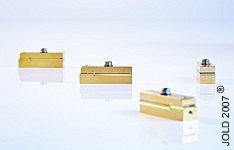 Figure 2: Photograph of actively cooled diode bars from JENOPTIK Laser Diode GmbH. A non-ideal property of diode bars is the spatial pattern of its emission. In the “fast axis” direction (corresponding to the vertical direction in Figure 1 and 2), the emission comes from a very narrow region, so that the beam quality is not far from diffraction-limited (M2 factor not far above 1) despite the strong beam divergence angle of typically 30–40° FWHM (full width at half-maximum). On the other hand, the “slow axis” direction has a very wide emitting region, so that despite the much smaller divergence angle (of the order of 6–10°) the beam quality is very poor, with the M2 factor > 1000. Significant efforts are therefore often required for conditioning the output of a diode bar (or of multiple diode bars in the form of a diode stack). The large numerical aperture (NA) of typically ≈ 0.6 for the fast axis requires high-NA aspheric lenses for collimating the beams while preserving the beam quality. Fast axis collimators, containing a kind of cylindrical lens (often with acylindrical surface for reduced spherical aberrations), are often used for that purpose. There are also slow axis collimators, where the demands are lower concerning the NA of typically ≈ 0.1, but nevertheless not uncritical for diode bars with high fill factor (see below). When beams with approximately circular beam waist and reasonable beam quality are required, a special beam shaper for symmetrization of the beam quality can be applied. For more details on beam collimation, see the articles on laser diode collimators and beam collimators. A potentially disturbing property of diode bars is the “smile” – a slight bend of the horizontal line connecting the emitters. Smile errors can have detrimental effects on the ability to focus beams from diode bars. There are some advanced beam conditioning schemes where the smile of individual diode bars is compensated. The reason for the use of diode arrays instead of simply making very broad single emitters is that the latter would suffer from amplified spontaneous emission or parasitic lasing in the transverse direction, or from the formation of filaments. Diode arrays can be operated with a more stable mode profile, consisting of one so-called beamlet from each emitter. There are several techniques which exploit some degree of coherent coupling of neighbored emitters, leading to better beam quality. Such techniques include those directly applied in the fabrication of the diode bars and others involving external cavities. Most diode bars, however, are used without such a technique. Important design parameters of diode bars are the number of emitters, their width and spacing. With respect to beam quality and brightness, it is ideal to get the output power from a small number of closely spaced emitters. However, the optical intensity at the output facet is limited by the risk of catastrophic optical damage of the mirror coatings, and the output power is also limited by the active volume. In addition, closely spaced emitters may be too difficult to cool, at least in continuous-wave operation; such diode bars are sometimes used only in quasi-continuous-wave operation with not too long pump pulses. Note that the array geometry makes diode bars very suitable for methods of coherent or spectral beam combining, which make it possible to obtain a much higher beam quality. Many diode bars are sold in fiber-coupled form, because this often makes it much easier to utilize their output and also makes it possible to mount the diode bars with their cooling arrangement in some distance from the place where the light is used (e.g. a diode-pumped laser head). Usually, the light is coupled into a single multimode fiber, using either a simple fast-axis collimator and no beam conditioning in the slow-axis direction, or a more complex beam shaper to preserve the brightness better. It is also possible to launch the beamlets from the emitters into a fiber bundle (with one fiber per emitter). The semiconductor chip of a diode bar is soldered to a thin submount, which also gives one of the electrical connections. An insulated wire bond plate provides the second connection. The submount is then mounted on some heat sink, which is often water-cooled (with a macrochannel or microchannel cooler), allowing for a high fill factor (ratio of emitter width to total width of emitting region) of e.g. 80% and thus for a high brightness. Conduction-cooled bars (often used with a thermoelectric cooler) have a lower fill factor of e.g. 30%, because the heat can be extracted less efficiently. In both cases, diode bars are often produced in sealed packages. Electrically, the different emitters are all connected in parallel. This means that the overall drive current (to be delivered by the laser diode driver) is substantial, of the order of tens or even hundreds of amperes. One obtains roughly 1 W of optical output power per 1 A of current; combined with the typical voltage drop of the order of 2 V, this results in a power efficiency (→ wall-plug efficiency) of the order of 50%. Further developments are under way (e.g. in the context of the SHEDS program of DARPA) to reach 80%. Crucial technological issues are to reduce the operating voltage by optimizing electrical contacts and layer structures, to reduce further the thermal impedance, and to improve methods for facet passivation, effectively allowing higher optical intensities without the risk of catastrophic damage. Improved power efficiency reduces the total electrical power demands and also the demands on the cooling system, and further usually allows for higher brightness. Often it comes with the additional effect of reducing the price per watt of output power, which is already well below 30 US dollars. Under ideal conditions, diode bars can have lifetimes of many thousands of hours. However, devices often fail long before the specified lifetime is reached. This is not necessarily a consequence of faults in the production or the design, but can be caused by a variety of factors outside the control of the manufacturer, such as short voltage spikes caused by a defective or ill-designed diode laser driver (often during switching the device on or off), or by too high an operation temperature, which itself can be caused by too high a drive current or insufficient cooling. Water cooling is usually fairly effective, but its effectiveness can be strongly compromised by corrosion, which can occur e.g. when the specifications for the chemical condition of the cooling water (particularly its ion content) are not met. On the other hand, too strong cooling can cause problems via condensation, when the dew point is reached. Obviously, the whole diode laser system has to be properly designed in order to exploit the full lifetime potential of the bars. The emission bandwidth of a diode bar typically amounts to several nanometers, which can be more than desirable for pumping a solid-state laser. In addition, there is typically a tolerance of several nanometers for the center wavelength. A strongly reduced wavelength tolerance and emission bandwidth may be achieved with optical feedback, e.g. from a volume Bragg grating. This can facilitate, e.g., the pumping of a solid-state bulk laser. Bandwidth and exact center wavelength can also be important for spectral beam combining. High-power diode bars are used e.g. in material processing (e.g. welding and certain surface treatments), as medical lasers (e.g. for photodynamic therapy, tattoo removal, laser surgery), or for pumping high-power solid-state lasers (bulk or fiber lasers). Diode bars are also developed further for military use as battlefield laser weapons. In the future, they may also increasingly be applied in large-volume consumer products such as cars. For very high powers (above roughly 100 W), one uses diode stacks, which are essential several diode bars stacked in the vertical direction. RPMC Lasers offers a wide range of laser diode bars ranging from the red through the IR. These are available unmounted or packaged on a heatsink. 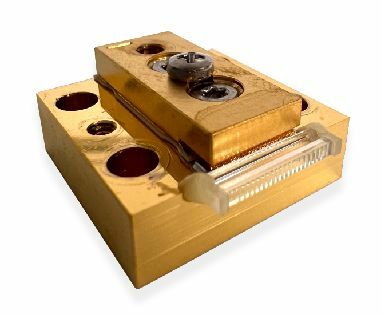 We also offer fiber coupled laser diode bars.